Bobby’s mother reads two spooky tales to the ghost of her dead son. The first tells of a family and their food shortage issues. The second story features a zombie clown from Hell. When we finally return to Shirley, she kills her hot-headed boyfriend, and there’s a bloody finale as the cops arrive. 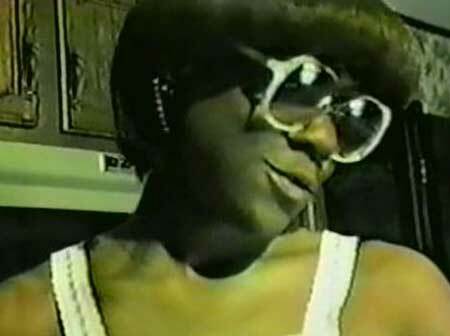 The legend of Chester Novell Turner is a strange & compelling one indeed. Way…WAY back in 1984 he came upon the idea of writing, producing and directing his own film and decided that a horror film would be the most popular (& easiest one) to make. So he went ahead and wrote, produced & directed something called “Devil Doll From Hell” which featured an extremely foul mouthed & horny ventriloquists dummy. And he shot his first feature film with a retail camcorder (the kind you filmed your family picnic with) to boot. As a matter of fact Chester did all of that and more, he also wrote & performed the soundtrack to the film (on a Casio keyboard) and he edited the film as well. Sadly he hooked up with a shady video distributor and never saw a dime from his first film so he took some time off but returned 3 years later with an idea for a new film that he would self distribute directly to retail video rental shops. But although the technology had advanced in the three years that Chester took off, his skills didn’t and the resulting film was called “Tales From The Quadead Zone”. 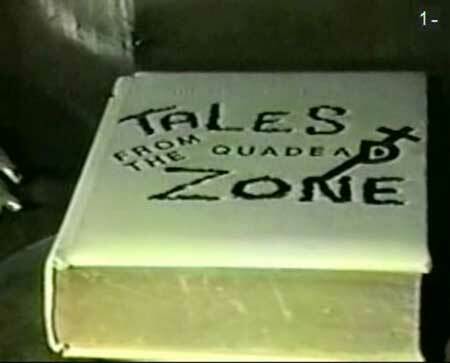 Shot, once again, on a conventional camcorder, Tales From The Quadead Zone tells the story of a mother (Shirley L. Jones) who returns to her home to talk to a ghost (named “Bobby”) who has brought a book along with him for her to read to him. The title of the book is the title of the film and she proceeds to open it up (after commenting on how interesting it looks) and pick a story out to read to him. The second story is called “The Brothers” and it tells of two brothers who’ve hated each other’s guts since birth (Technically impossible I should think) and the lengths one of them will go to in order to belittle the other, even after he’s dead. The surviving brother’s idea is to steal his brother’s corpse and dress it up in a clown costume before burying it in his basement…that’s it. His “Evil” plan is to dress a corpse up like Bozo & bury it in a grave in his basement. And while I’m sure that his dead brother isn’t gonna like this idea much I doubt that it’s going to bother him too much – he is dead after all. But in true horror form, the brother’s spirit returns to his body as his grave is being dug and guess who ends up in that grave instead? Once again production values are of the non existent variety and the actors can barely be heard most of the time…EXCEPT for the maniacal laughing of the one brother who talks about how much he dislikes his sibling as he digs the grave. He laughs constantly in an attempt to pad the running time and it becomes quite a chore to listen to him after a few minutes. When Bozo resurrects himself his dialog is completely unintelligible but what does it really matter? We all know what he’s fixin’ to do anyway. The third story (I’m being charitable calling it that) is called “Unseen Vision” and it’s the story of the young lady reading the book to the ghost. Turns out that the ghost is of her dead son Bobby and they still enjoy a healthy mother/son relationship, never mind the fact that one of them is 6 feet under. 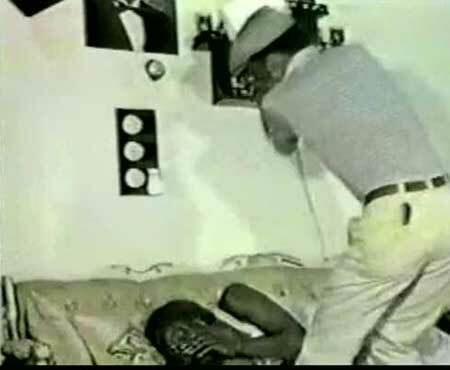 Bobby’s mother has an abusive boyfriend who beats on her when he finds her talking to someone who he can’t see and after a fight (That seemingly goes on forever) she stabs him to death. She then takes her own life and joins her son in the afterworld but first she has to sit down and read him another tale…from the QUADEAD ZONE! 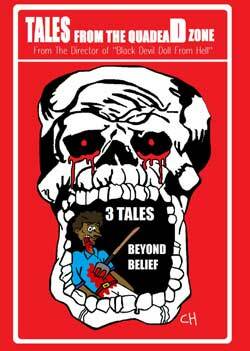 At barely 60 minutes long Tales From The Quadead Zone hardly qualifies as a full length feature film and looking at it will only cement that notion in your head. It looks/sounds terrible. It features terrible actors. It’s “3 Tales Of Evil Beyond Belief” (Their words…not mine) are hardly evil and the only thing that’s beyond belief about any of them is that someone actually set pen to paper and this was all they could come up with. There’s a bit of blood tossed about but it doesn’t make much of a impression. The, mostly implied, violence isn’t very violent either. It also features some terrible artwork (From Ms. Jones herself) and a god awful theme song sung over the opening credits that screeches something about “Entertaining” us that just makes the entire putrid package complete. A complete and utter train wreck, right? So why did I have a good time watching it? To be honest with you I dig the fact that Turner fought to keep his dream alive and went ahead and made two films with the meager resources he had at his disposal. Is any of it good? Hell no! But it’s immediately evident that it’s all coming from his heart and deep down in my wretched little black heart…I respect that. Nowadays anyone can make a movie (& judging from a lot of the dreck I receive in the mail everyone does) but that was hardly the case then. Professional shooting cameras were far too expensive for a small timer like Turner back then so he just went ahead and worked with what he had on hand. He certainly couldn’t afford an editor so he just edited it himself (Most likely in camera as he shot). And who really needs a professional music composer when he had a nifty little Casio that produced a sound something akin to an Atari 2600 videogame system? There’s no way I can stomp on any of this because as ridiculously bad as it all is (& it is ridiculously bad), it’s from his heart. I refuse to toss dirt on a man’s dream despite his attempts to get me to do so by giving it a negative review. As a matter of fact there are those of you who’ll definitely enjoy this calamitous crap fest as I sorta did because we live to see stuff like this. What Chester lacked in equipment, crew & talent he made up for with heart and a dream to become a film maker. And I’ll be good god damned if he didn’t go and make not one but two films! I certainly never made any films and how many films have any of you reading this ever made…huh? In the end I got a thrill about seeing a film that was at one time purported to be just a rumor. Some of you will most definitely be entertained, most of you won’t but none of you will ever forget your first (& hopefully last) foray into…The Quadead Zone. And I really believe that when it’s all said and done that’s all any director really wants…for their film to be remembered. Congratulations Mr. Turner, you’re gonna be remembered for this one. Tales From The Quadead Zone – 0 out of 5 shrouds for the finished film but 5 out of 5 shrouds because it’s so darned earnest.